The Ministry of Health has set a number of goals for improving healthcare by 2025. Lower-than-expected score attributed to high rate of alcoholism and suicide. Russia rated in the bottom third of a global ranking of population health in a report released last week by British medical journal The Lancet; the country ranked 119 out of 188 nations. The report, based on analysis by 1,800 scientists, graded nations on 33 health indicators approved by the UN in September 2015 as part of the Millennium Development Goals. The study ranked countries’ performance from 1990-2015 on a scale of 0-100 on the indicators, which included access to clean water, sanitation, contraception use, level of smoking, level of alcohol consumption, suicide rates, infant mortality, domestic abuse, rate of HIV infection, rate of Hepatitis B infection, obesity in children and road injuries. Iceland, Singapore and Sweden shared 1st place, with an average score of 85 on the 100-point scale. The global average was 59 points. Andorra and the UK rounded out the top five. The scores for other former Soviet republics varied widely. Ukraine and Belarus scored alongside Russia, in 118th and 120th place, respectively, while Estonia was 29th, just one place behind the United States. Latvia and Lithuania also ranked in the top 50, coming in at 45 and 47. Uzbekistan was 55th; Turkmenistan, 60th; Azerbaijan, 75th; and Moldavia, 80th. The lowest ranking countries were South Sudan and Somalia, which tied for 186, and the Central African Republic. Russia’s results were unexpected — its score of 54 was 19.5 points lower than had been predicted. The country scored the lowest on rates of alcohol abuse, receiving 7 points out of a possible 100; suicide rates (21 out of 100); and death from violent causes (25 out of 100). Despite its higher ranking, the U.S.’s score also came as a surprise to experts, who attributed the underperformance to high levels of gun crime as well as high levels of obesity. 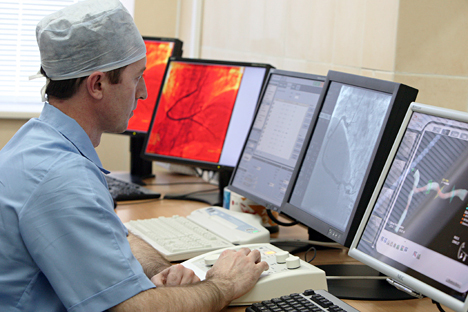 Although Russia provides healthcare to its citizens, the quality of care has deteriorated rapidly since the economic downturn that began in 2014 due to cuts in spending. Private healthcare options have been available in the country since 1996, and the number of private clinics is growing. Russian citizens are able to use their state insurance policies to cover some private services. The Ministry of Health has set a number of goals for improving healthcare by 2025 according to a development plan released at the end of 2012, which include lowering maternal and infant mortality; widening access to healthcare in remote areas; increasing the number of local doctors; and increasing public access to medicine.